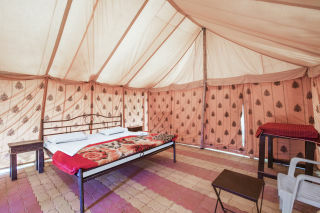 Located in the glorious Thar Desert, this offering of a tent can accommodate up to three people. The stay is perfect for couples seeking a unique experience. Breakfast is complimentary here, and all meals can be prepared on request. Parking is available, as are the services of a driver. 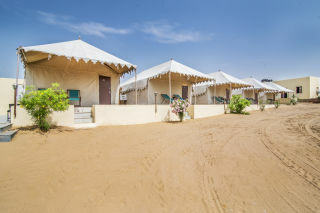 Your Space Surrounded by the magnificent Thar Desert, this accommodation is luxurious and elegant. 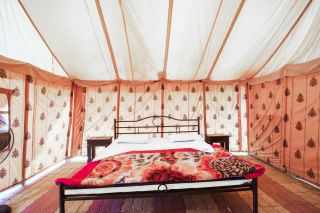 The retreat on offer is a Swiss-style tent on a well-paved platform. 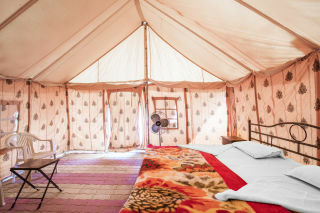 Inside, the canvas tent is furnished with a wrought-iron bed, bedside tables, a couple of chairs, a coffee table, and a utility table. The en suite bathroom is fitted with western sanitary ware. Guest access You are allowed access to the entire property. Guest interaction We provide you with the services of a caretaker to assist you throughout your stay. Neighbourhood overview Our property is located close to many tourist attractions. 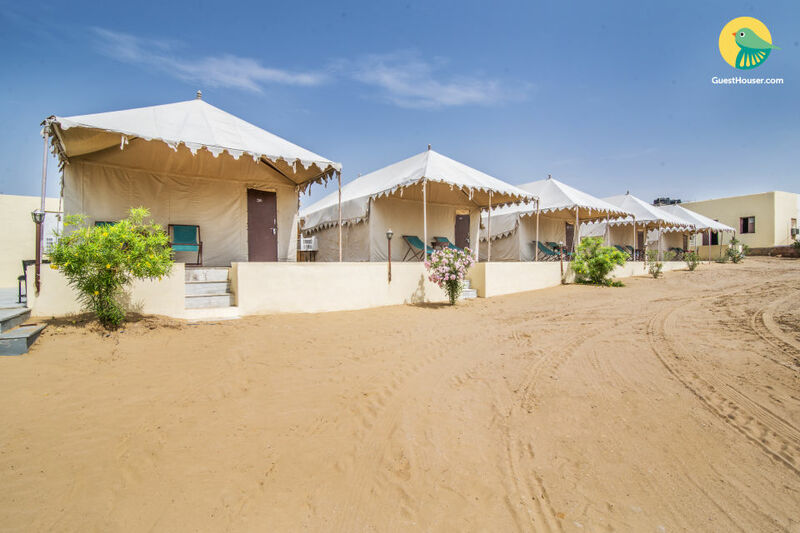 Some of the places you can explore are- Sand Dunes: 50 m Desert National Park: 10 km Khaba Fort: 15 km Kuldhara Haunted Village: 18 km Jaisalmer Fort: 40 km Getting around Our property is located 46 km away from Jaisalmer Airport, and 40 km from Jaisalmer Railway Station. It is 42 km away from Jaisalmer Bus Stand. You can hire a cab from here to reach the property conveniently. Additional information Guests are requested to provide valid ID proof at the time of check-in. 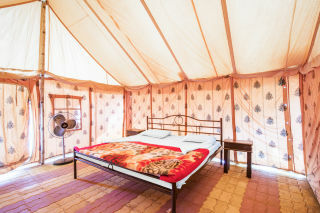 We have camel safari, jeep safari, and paragliding activities that you can be a part of at an additional charge. A cultural programme and 1 hour DJ party is complimentary for you. We provide few activities which is included in package: 3 km camel safari. Sunset point. Traditional welcome. Welcome drink. Tea/coffee/snacks. Cultural programme. D.J party. Camp-fire. Fire dance. Everyone can enjoy our desert evening package in that your evening will be laced with melodious folk music and dance around roaring camp fire performed by Kalbeliyas & Langa parties who are popular globally for their dance and music. To make the evening memorable we have camels to ride through desert of Sam. 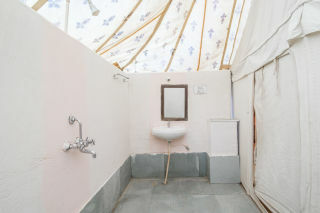 All the tents have attached toilets with running water and hand showers. 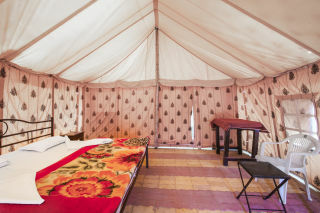 Running water is provided not only at base camp, but also on the mobile camps while on a camel safari.